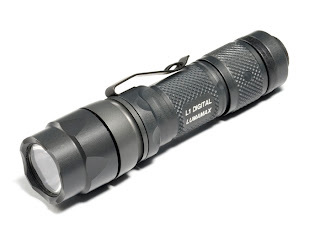 This is a new version of the L1 flashlight by Surefire, the biggest change is that the LED is now a Cree LED replacing the Luxeon LED in the previous model, the body length is shorter making it even better for EDC. The inmediate result is a light brighter, with longer runtime and a more compact size. The L1 uses a single C123 cell rechargeables can be used but the body may not be wide enough for protected cells, this probably means Surefire wants you to use primary cells and not rechargeables in this light. It claims 65 lumen in high mode and about 10 lumen in low mode. Those values are according to our tests underrated, we estimate around 85 lumens on high compared to other lights we have around. Runtime is 1.5 hours in high and 16 hours in low mode. Since the Cree is a more efficient LED there is a marked improvement in runtime. When running on high the thermal protection might kick in dimming the light, this probably means that the L1 is designed to be used in low mode with a very long runtime with the high mode available when needed providing a good amount of light with great runtime and a burst mode available. The beam is round and very smooth, with a long throw and usable sidespill, the lens is slightly frosted to eliminate beam artifacts and the light uses a TIROS optic to focus the beam so it is a light designed for throw with a lens that corrects imperfections diffusing the beam a little. The loss of light due to the lens frost is probably minimal. The new Cree led is very bright so the new L1 will outperform many other LED lights, in terms of brightness the new L1 in high mode can compete with the L4 and it only uses a single battery. The tactical two stage switch is easy to operate, tighten for low mode and keep tightening for high mode, the button can be pressed for momentary low/high when off or momentary high when you are in low mode. Unscrewing the tailcap will put you in lockout mode. You can also unscrew the tailcap to only allow momentary low avoiding a very bright light when not desired. As in many other Surefire lights the construction is excellent in HAIII aluminium, strong as it can be, it won't get scratched or damaged by impacts. O-rings make the light waterproof. The L1 is an excellent EDC light, very bright and with excellent performance in runtime, the two stages makes it very useful as an all-around light. You can read more at Surefire's website retail price is $135, you can get it from OpticsHQ. 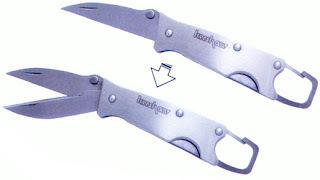 The twocan is an interesting combination of a knife and a pair of scissors by Kershaw. When closed the twocan is just 2-3/4'' long (70 mm) and weights 0.9oz. The material is stainless steel, it has a nice solid carabiner that has good pressure and can be used to clip the tool to a backpack, belt loop, keychain, etc we don't think the carabiner can open by accident so the risk of losing the tool is very low. After deploying the first blade you have a wharncliff style knife that is 1 1/2'' long, very sharp and pointy from the factory can be used to open boxes, make sharp cuts, remove splinters and many other tasks. Things get interesting when you deploy a second blade that opposes the first one and has a spring mechanism converting the knife in a pair of scissors. There is no handle so you use the scissors pushing the spring blade with your thumb. The scissors cut excellent because the blades are very sharp and the fit is perfect, they will get a little difficult to use for long cuts because your hand will get in the middle of what you are cutting but for small precision cuts they are great, small rope, fishing line, paper, cardboard are cut without any problems. The twocan is a great combination of a pocket knife and scissors in a small size and with superb quality construction. You can get it from Knife Center for $20. The Micro Wallet is a minimalistic wallet for people that don't like or can't carry big bulky wallets with millions of items. The Micro is 4.5'' x 3''. When opened it offers an ID window and two card slots. There is a single division running along for bills. When closed the Micro has a small pocket in one side, there is no closure mechanism, no velcro or anything similar, just fold it and put it in your pocket. 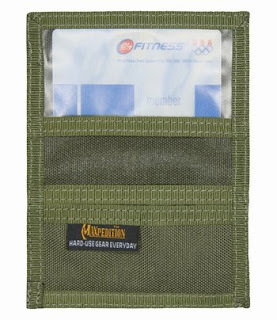 The construction is very strong in cordura nylon with double stitching along the borders. It will not get destroyed by metallic objects such as keys in your pocket. Maxpedition claims you can fit one ID, two credit cards, some bills, two quarter coins and a spare key in the Micro, this is as far as we could test true, being small if you load it with too many items it will be hard to fold and inpractical. As an interesting point the strong cordura nylon used for this wallet makes it a little heavier and bulkier than what you would expect for a Micro wallet, we believe a lighter and thiner material would have been a better choice. You can read more and order for $11 from Maxpedition's Website.